The Brussels griffon is a compact and sturdy dog that is often considered to possess a human-like facial expression. Lively and alert, the Brussels griffon is a pleasure to know. Dogs of this breed are joyful and loyal companions that, with proper care and training, can become excellent family dogs. 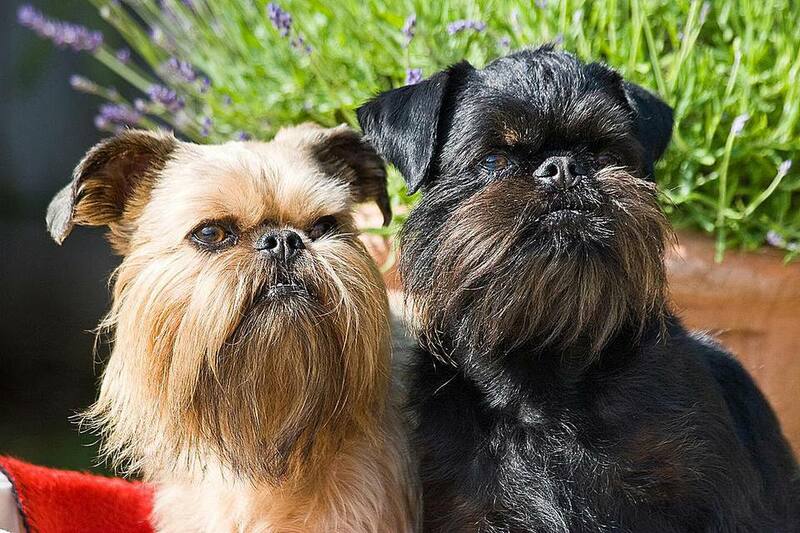 The breed is also known as the griffon bruxellois and may simply be called griffs. The Brussels griffon, as indicated by its name, emerged out of Brussels, Belgium. Its ancestors were used by coachmen during the 19th century as ratters in the stables. These Belgian dogs were similar to affenpinschers, but their exact further development is not quite clear. It is believed that these dogs were crossed with pugs and English toy spaniels, eventually resulting in two types: the rough, wiry coat variety and the smooth coat (called the brabancon). The breed was brought into the limelight when Queen Marie Henriette of Belgium began breeding them and showing them. This led to them being exported to England and the United States. The Brussels griffon was first recognized by the American Kennel Club (AKC) in 1910. However, they almost disappeared in Europe due to the two World Wars and they remain fairly rare. Though they are no longer needed as workers, they have become known as wonderful companions. A Brussels griffon was featured in the Jack Nicholson/Helen Hunt movie "As Good as It Gets" in the 1990s. They are popular social media stars as they look just like a Star Wars Ewok in the appropriate garb. The smooth coat Brussels griffon requires little more than routine grooming with brushing twice a week, but you will have to expect some shedding. The rough coat variety sheds much less and needs to be brushed twice a week, but will also need to have the coat hand stripped every three to four months. If your dog is of the rough coat variety, you may want to have him kept in the schnauzer clip to avoid the need for stripping. Many groomers no longer do stripping, which is a chore and can be uncomfortable for the dog. The Brussels griffon is a smart little dog, and therefore quite receptive to training. Like many small dogs, this breed may possess a feisty streak and be stubborn. Firm, consistent training can help your Brussels griffon become obedient and attentive. One aspect of training is in teaching your griff to stop barking after giving you an alert. They are attentive watchdogs but need to learn that command so as not to become problem barkers. Housebreaking is another training challenge with a griffon. Crate training is recommended to prevent them from learning they just need to sneak under a table to do their job. You will need to be diligent and some griffons are never completely housebroken. Like all dogs, the Brussels griffons should receive routine exercise. Plan a daily walk at the very least. Be aware that griffs are amazing climbers and jumpers, which you might not expect with a small dog. But you may need to protect your dog from taking a fall that could injure him. Their flat faces don't allow them to cool the air when breathing and this means they are more susceptible to overheating and heat exhaustion. Only exercise during the coolest part of the day on hot days and never leave your dog unattended in a vehicle, even on cooler days. They also don't tolerate cold weather well and may need a sweater on cooler days. Socialization is important for the griffon. They can be suspicious of new people and they can be fear biters, snapping when they are frightened. Early exposure to other dogs and new people can help them learn not to be as fearful. They are prone to being territorial and are not afraid of challenging larger dogs, which can lead to tragedy. However, griffons often do well around cats. Expect your griffon to be glued to his favorite human. This is not a breed that can be left alone for most of the day. A griffon will become sad and bored and can be very destructive when ignored. Griffons are not recommended for families with small children as they will snap and growl when hit, chased or picked up when they don't want to be. If raised together with children you may be able to coach your kids to let the dog determine how they will interact. Children will need to recognize when the dog is uncomfortable and allow the dog to retreat. Feed your griffon two meals a day of up to 1/4 cup of dry dog food. The amount your dog needs will be determined by size, activity level, age, and other factors. Be sure to monitor your dog's weight as even one extra pound is a lot in a toy breed. Obesity will shorten your dog's lifespan and increase the risk of other health conditions. Discuss your dog's nutritional needs with your veterinarian to get recommendations. Before you decide to adopt a Brussels griffon, be sure to do plenty of research. Talk to other Brussels griffon owners, reputable breeders, and rescue groups to learn more. There’s a whole world of potential dog breeds out there. With a little research, you can find the right one to bring home.